Pop Mama: Baby Hair Gone. On Saturday I let a random hair stylist cut off Cam's baby hair. My son was born bald (despite my copious amounts of hair/curls) and pretty much stayed that way until his 1st birthday when his hair finally started to fill in. I had held off having his 1st haircut until now and although his do wasn't out of control (like many a celebrity kid), getting a trim was definitely needed. 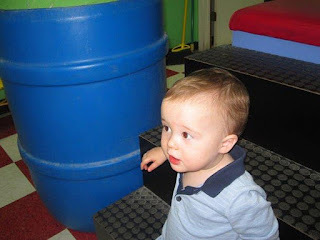 We took him to a "kiddie" place where they have animals to sit on, a movie is playing on the TV and the haircut literally takes 5 minutes (depending on the hair I suppose). Of course he wanted nothing to do with sitting on the animal so my husband had to hold him in his lap. 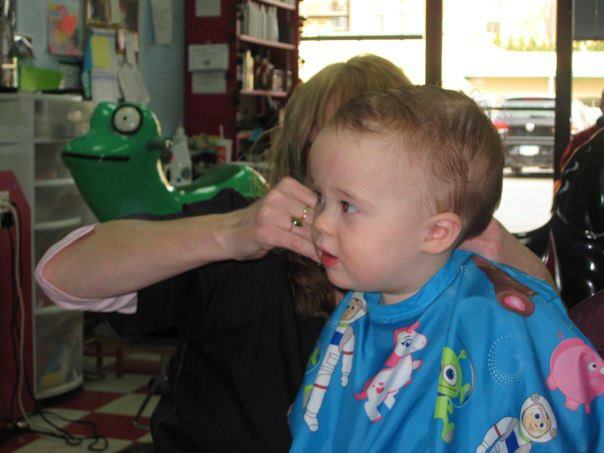 I watched as the hair stylist clipped around his little head while Cameron sat watching The Polar Express and curiously peeked at the other customers. 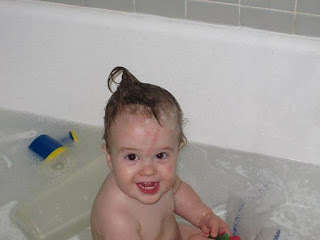 I watched as she cut off his baby curl at the nape of his neck (which in truth was starting to look like a rat tail circa 1986). I was sad. My little baby is no longer a baby. He is a boy -- with definite opinions about what he wants, likes and needs. He is a toddler who throws fits when we have to leave a playdate and he is a big boy who will blow me a kiss good-bye when it is time to go into daycare. The 1st haircut will be recorded in his baby book, the locks of hair will be saved in a tiny envelope and the pictures uploaded. I'm glad I went to do this with him before my new baby arrived because I know that things are going to get pretty hectic for awhile. I am savoring my moments as a mother of one and this was one that I won't forget.